As we’ve just finished Easter, I thought this would be a good place to start. I don’t know about in your own spiritual journey, but I tried following rules before I succumbed to grace. If you’ve never tried earning your own salvation, let me tell you, it’s an exhausting prospect. It’s literally impossible to do right things with right motives all the time. And even if you could, any wrong things you’d done (or right things with wrong motives) would still be around proclaiming your sinful state (if you want to read more on this subject, I addressed it pretty thoroughly in my book Tales from a Spacious Place, pp 187-208). I spent quite a lot of time trying to cross all my t’s and dot all my i’s, and then I just gave up because nothing I did or didn’t do seemed to make any difference. And that is when grace came in. God taught me that what I was incapable of doing on my own, He had done. Jesus lived a perfect life and died for me. He traded records with me. When God looks at me, He sees Jesus’ righteousness, rather than my sin. It’s easy to come to an understanding of the Gospel and apply it at a single moment in time. I still find myself caught in a performance trap with God at times. But that isn’t who I truly am. The Gospel still applies to every moment of my life, not just that moment of salvation. Spiritual rest means that I stop trying to earn God’s favor, stop trying to live a right life on my own, stop putting on a show for God. Instead I rest in what Jesus has already done. I was so wicked that God had to die for me. I am so loved that He did it willingly and joyfully. Once the Gospel has permeated every facet of our existence there is such peace. No need to impress. No need to muster up love or any other part of the fruit of the Holy Spirit. Just relying on Him to work in and through and for me. This kind of rest can’t be forced. And it can’t be faked. It can only be given by God. Where are you at with God? Are you spending all your time striving? Do you wear a mask with Him? He is so ready to rescue you from your own perfectionism. He is so ready to love you for who you are. God, thank You for making rest impossible apart from You! Thank You for creating that need, so that we wouldn’t wander through our lives oblivious to You. Jesus, thank You for dying to bring us true rest. Change our hearts. Lord, we need spiritual rest and You are the only one who has it. Root us and ground us in Your love, so that we are never tempted to be anything less than real with You. We come to You as broken, tired people. Teach us the truth of Your Gospel in all the rest of the moments we have. In Jesus’ Name, amen. I actually wrote this last week. Reminded me how great God’s timing is–after a migraine (me) and puking (my daughter) yesterday, I needed to hear it today! In Bible study this week the question was posed, “If you could have God change anything in your life, what would it be?” So what about you? What would you change? Stop and think for just a moment. I bet something popped right into your mind when I asked that. Of course, my mind began running in tight circles round circumstances—broken relationships, a broken body, friends in trouble, various daily stressors—and then I was brought once more to the realization that my circumstances don’t need to change. Bet I shocked you there. My circumstances don’t need to change. Yes, some of them are uncomfortable or downright heartbreaking. Yes, they’re a reflection of life in a broken world and it’s right and good that I long for and pray for something better—for God’s redemption, for Christ’s return. And yes, I wholeheartedly believe (and have seen) that God gives us a foretaste of the perfect by redeeming bits and pieces in the midst of brokenness. However, these are the circumstances God has put me in. They’re not some haphazard collection of things that just happened to me; they are the perfect life learning lab for me. I need these circumstances to grow. God’s promised that He works everything out for the good of those who love Him. I’m His child. I love Him, therefore, He’s working them out for my good. But still, who isn’t worn out by the difficulties of life in a broken world? The more I thought about it, I realized that I want new circumstances, not because I just like change or because new is always better. I want what I think will be better because I believe better circumstances will automatically bring contentment and happiness. But contentment isn’t about circumstances, it’s about character. I started wondering how hard circumstances would be if I actually loved each person in my life with God’s love. Would it really be that hard not to lose my temper at the guy who cuts me off in traffic or at my crazy kids? I imagine even a dash of real love would significantly change my perspective and my response to this lab. In the end, once I’d sorted that out, I found myself praying for a supernatural change in my character, a Holy Spirit outflow of love, faith, and humility… for the fruit of the Spirit. The past couple weeks I’ve been relapsing up and back down the wazoo (health-wise)… and consequently doing a lot of escaping into fiction or struggling just to get through daily tasks. It’s been a rough time. And in the midst of all the pain and turmoil, I’ve been meditating on perspective. Here’s the view from my back deck. 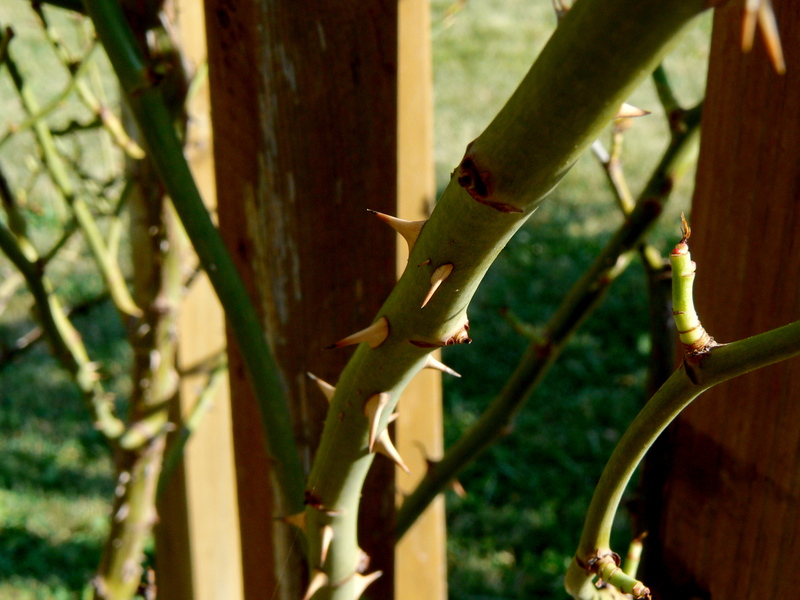 Quite often, when I look at my life, this is all I see–the thorns. I complain about all the difficulties, the exhaustion, the hard work, etc., etc. And then, every so often, God reminds me that this isn’t the whole picture. If I looked around, maybe I would see something like this. This is also from my back deck. All my lovely thorns come with something amazing. God allows difficult times because they can flower into something beautiful, and when I take the time to examine my surroundings, I can see glimmers of the amazing all around. Perspective… a frame for everything we experience… a choice to see something a certain way. In my mind, perspective is like a habit. So rather than wearing down a path to view my thorns by complaining and focusing on the negative, I’m trying to discipline myself to see God’s grace at work in my life. My roses are things like having a wonderful husband, children I delight in, a place to live that’s perfect for my health issues, a calling that makes me more myself, a past that makes me desperate for God, an unwillingness to be content with the mediocre, friends who listen… the list goes on and on. How about you? God, open our eyes to see You at work. Rip aside the veil of our apparently mundane trivialities and show us Your hand and Your grace. 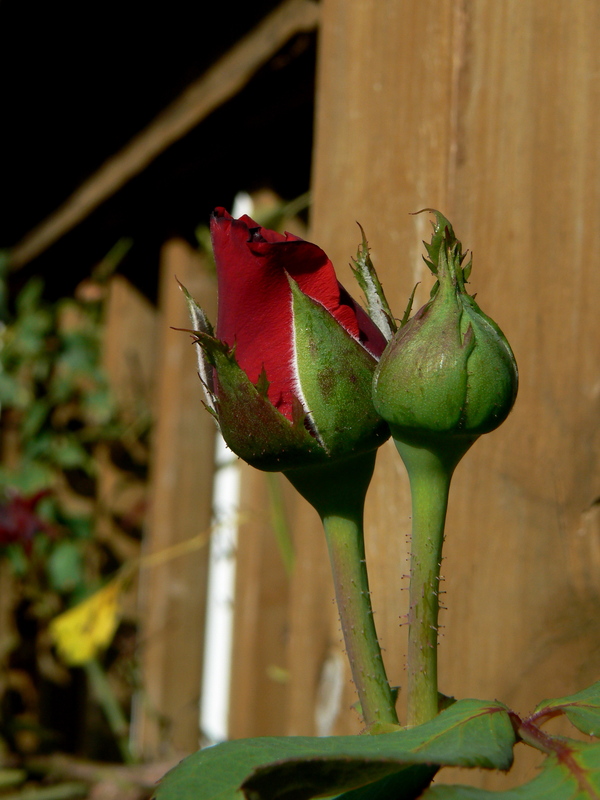 Expose the roses in our lives, God. Give us a hunger for more than just surviving the thorns. Perfect us through those thorns. I love You! In Jesus’ Name, amen. However, as Easter approaches, I’ve been thinking about what this passage shows us about God’s character and how that’s displayed in the Gospel. The God who gives generously to all…that’s who we serve. Not a stingy God. But a generous one. And we see just how generous in the Gospel. God died for us. He gave His Son for us. Not once we’d cleaned up our act, but while we were still sinners and enemies of God. I used to be an enemy of God. Some folks blissfully ignore Him (and pretend they aren’t enemies), but I fought Him. I hated Him. I wanted nothing to do with Him. And yet, He gave generously to me. He gives generously to all. Whoever believes in His Name can be saved. There’s never a category of person who He won’t give to. You can be poor, rich, any ethnicity, any background. The only thing you can’t be is someone who won’t believe. That’s the kind of person who shouldn’t expect to get anything from God. Faith, the prerequisite of the Gospel. Abraham believed God even though he didn’t have a background in following God or hearing about God. He was called out of a pagan nation. And yet, he believed God and it was credited to him as righteousness. I love the consistency of Scripture. God is the same God from Genesis 1:1 to the end of Revelation. We see the Gospel writ large across the entire Bible. And here in James we see that He’s still the same–the God who gives generously to all who believe. I’ve been thinking that I ought to write some sort of Christmas post–if for no other reason than to get my heart refocused. Unfortunately, I feel more Scrooge-like than normal this year . . . health challenges, family issues, and loss have left me feeling more like crawling into a small cave to hibernate for a few months rather than celebrate. Plus, realistically can anyone really focus on “the true meaning of Christmas” amidst the commerciality of the season? How can you “be still” when there’s a to-do list about a mile long and more time commitments than normal? Fortunately (for me) my husband got a traffic ticket on his way home from work two days ago (yes, he gave me permission to share). He got home and I tried to console him. Two hours later the cop called and told him to rip up the ticket and “Merry Christmas.” I’ve never heard of that happening. I’ve gotten off with my share of warnings (got pulled over the day before AND the day after my wedding). But never legitimately received a ticket and then had the officer cancel it later on. It got me meditating on God’s grace. I admit my knee-jerk reaction is to focus on the grace of God displayed in Jesus’ death around Easter and to focus on surviving the holidays around Christmas. However, yesterday I found myself lost in wonder at God’s grace displayed in Jesus’ life. The grace of God embodied in human form . . . getting cold and dirty and tired and helpless as a babe for the first time. God’s grace displayed in Jesus’ perfectly fulfilling the Law. I’ve been re-editing a section [of my book] on guilt and shame the past couple days. I’m awed that Jesus proved Himself a perfect sacrifice, but also that He performed righteous deeds so that I might have His righteous record. It’s so amazing seeing His lavish grace displayed in Jesus’ 33 years of righteous deeds in the face of Adam’s one act of rebellion that began the Fall. I really like the idea of my year revolving around God’s grace embodied in Jesus’ birth (probably in September) and His death (Passover). Hopefully, this year I can hang onto this small glimpse of grace even in the midst of all the hubbub. How do you stay focused on Christ in the midst of commercial Christmas?